Dr.Vicente Pérez, head of the University of Havana's Synthetic Antigens Laboratory, shows the first synthetic vaccine against haemophilus influenzae type b, a bacteria that causes pneumonia and meningitis, in Havana, November 21, 2003. 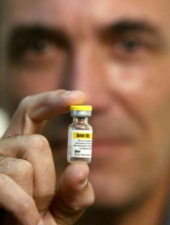 According to Cuba, this is the first vaccine for humans made with a chemically produced antigen, aimed at lowering the cost of immunizing children in poorer countries. Havana, November 15 (RHC)- A New Cuban vaccine has been released against "Hemophilia influenza type B," a bacteria that causes pneumonia and meningitis primarily in children up to five years of age. The technology to produce this vaccine, made from synthetic antigens, was jointly patented in 1999 by the University of Ottawa and the University of Havana. In statements to the press, Vicente Pérez, Head of the Chemistry Faculty's Synthetic Antigen Laboratory at the University of Havana, said that the vaccine is in the process of being patented in other nations and will begin to be used in Cuba as of January 2004. Pérez said that since 1999 Cuba had imported a similar vaccine produced using conventional methods, but that this was very expensive. The Cuban expert stressed that the hemophilia influenza type B is the main cause of nearly 50% of all infections in children under five the world over, even claiming the death of more than half million of these minors annually. To produce the vaccine, explained the Cuban specialist, it was necessary to reproduce bio-active molecules by chemical synthesis that were up to now obtained only through bacterial cultures. The new vaccine will be administered in three doses to children of two and four years of age and will be reactivated 18 months later. Meningitis and pneumonia could also cause deafness and mental retardation. The official presentation of the new Cuban vaccine will take place during a congress on biotechnology, set for later this month here in Havana. Despite being a poor, third world nation, Cuba has a vast medicine production, including the meningitis type B vaccine and the already famous PPG to reduce cholesterol levels significantly.